Ideally located near the Marina of Guadiana Sailing Association, the Historic Centre of the city, 300m away the Ferry crossing to Spain,500m away the Sports Center, 2.5Km away the Bay of Monte Gordo, 12 Km away the Natural Park of Ria Formosa,2 Km away the Salt Marsh Reserve of Castro Marim and 1h30 far from Seville. My son and I loved the layout of this beautifully decorated apartment.We particularly enjoyed the lovely private courtyard where we used the grill to barbecue and are our meals in the open air atmosphere. We were only 2 blocks to the waterfront walkway where we took many long walks and enjoyed the cafes and pastelarias.The ferry ride to Ayamonte is a must. Conceicao is a lovely lady,very thoughtful and gave us so much information about the area,what sites to see,where to eat and shopping areas. We drove to Tavira where you can spend days exploring the streets and to the the fishing village of St.Luzia where the fishermen were preparing their vessels for the season. We enjoyed the old fashion train ride out to the beautiful extensive beach at Barril(Isle of Tavira) where there there is a lovely cafe. Such a lovely couple, mother and son. It was a really pleasure to welcome these nice canadian people. They will be always welcome! Thanks! 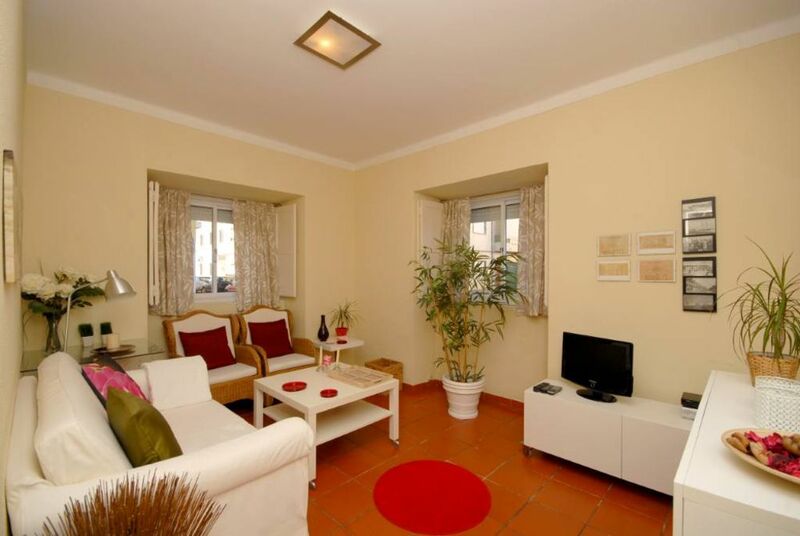 "The apartment is spacious, well equipped and comfortable and is only a 2 minute walk from the town centre. The owner lives nearby and she keep the property spotlessly clean. We found it a little difficult to heat but perhaps we were unlucky to have gone there during a particularly cold spell in January." El apartamento es exacto a las fotos. Muy cercano al centro del pueblo. Dormitorios amplios y cocina bien equipada. Con el frío se hace indispensable el radiador. Agradecemos a la propietaria Conceiçao, muy atenta y agradable, que nos ayudara con un problema con nuestro vehículo. Nos encantará volver de nuevo. Apartamento acolhedor, bem decorado, prático e funcional. O pátio interior fez as delícias da família. Bem localizado no centro da cidade. A proprietária é muito simpática e prestável. "O alojamento é fiel à descrição do anúncio publicado na Homelidays. Proprietários disponíveis e atenciosos. Boa localização." "El apartamento es conforme a las fotografias de Internet. Apartamento Super limpio,muy bien decorado,de facil acceso,en el centro de Vila Real,pudiendose desplazar sin coche para realizar compras,ir a muy buenos restaurantes,o tomar unas tapas. Tiene un magnifico Patio,muy bonito,con muchas plantas y flores,donde se puede desayunar o cenar sin ningun ruido.El apartamento esta en una zona,muy tranquila y apacible. La propietaria,muy amable y agradable. Te ayuda en todo lo posible. Volveremos el proximo Año sin duda." Airport of Seville - Take highway Seville-Huelva-Ayamonte, cross the international bridge of Guadiana, first exit in Vila Real Sto. António / Castro Marim, turn left into Vila Real Santo António-Center and the apartement is by the Marina. Faro Airport - take the A24 highway, exit in Vila Real Santo António/Castro Marim, turn right into Vila Real Santo António-Center.